Use these fabulous popper bodies as they are for a big bodied popper, or cut them in half and get two poppers in one! Available in four of our popular colors: Yellow, Chartreuse, White and Black. Available in three sizes: Small, Medium, and Large - Six (6) per pack. 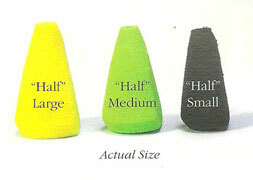 Sizes: Length by widest aspect of cone face. Small - 1" x 1/2"
Medium - 1 1/8" x 5/8"